Happy Saint Patrick’s Day! I started writing this post a while back, but I thought today would be the perfect day to actually get it out there. I’ve been thinking about Ireland lately. That may be why I got lured in to Nora Roberts Cousins O’Dwyer Trilogy. Maybe it’s because our trip there was about this time of year. 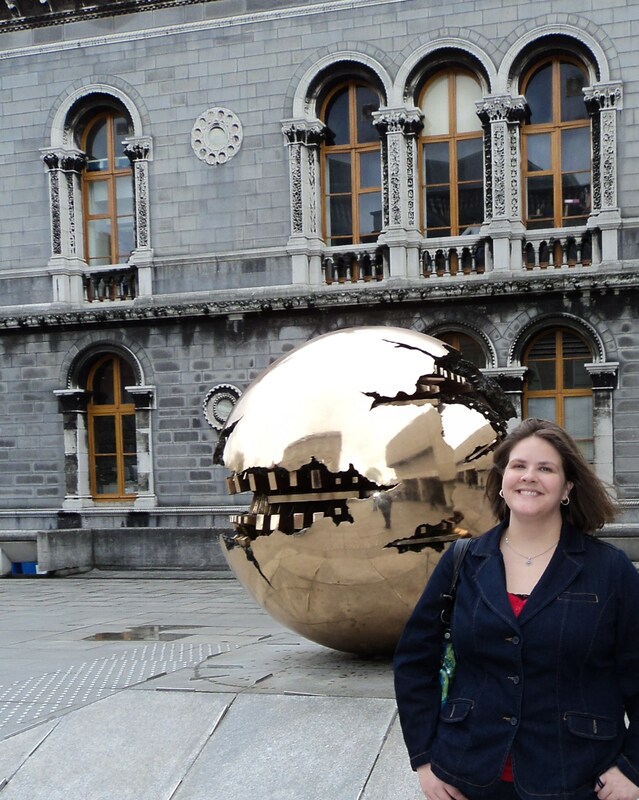 Maybe it is because my best friend and I are planning another vacation, and I’ve got the travel bug…again. (Okay, the travel bug never really goes away. Once you’re bit, it is a lifetime affliction.). Whatever the reason, I’m just going to roll with it here. When I came across this Marvin Campos film, I knew I had to share it. 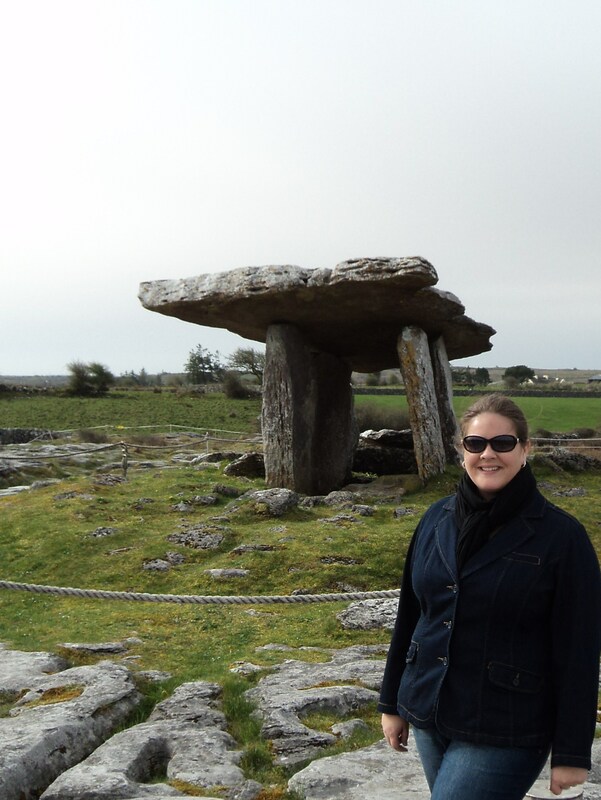 Although, I’d never been to Ireland before, and my family has a really difficult time remembering where my Irish great-greats came from, I felt completely comfortable there (well, minus the driving, but I caught on pretty quickly…mostly.) The people were friendly and helpful (we got lost a bit in Dublin. There is a street sign deficiency.) The food and drink were amazing, and the views…well, nothing is quite like it. We stayed at The Portobello B&B in Dublin, for a couple of days before driving to Lisdoonvarna in County Clare. Paul and Eileen Coughlin at the Portobello B&B took great care of us. Paul would come visit with us during breakfast, and was full of great advice for navigating the city. He recommended O’Neill’s for dinner our first night, which was wonderful, and quickly became a favorite. Just around the corner from Trinity College, home of the Book of Kells, in the heart of the city, O’Neill’s showed us that we were going to save a ton of money on food…if we could agree on what to eat. The portions were huge, and so very very tasty. We ended up sharing most meals on the trip, because the food was just too good to go to waste, and there was no way either of us could eat a full portion on our own. O’Neill’s also introduced me to Bulmers Irish Cider…although, I’d decided to try as much Irish whiskey as I could handle, one taste of the cider and I didn’t want to drink anything else during our stay there. (probably wise, because I really don’t think I could drink that much whiskey, although I would have made a valiant effort.) We stumbled upon The Bank the next night as we looked for the right bus stop to take us back to the B&B, and decided immediately that we needed a drink in The Bank. (We both worked for banks at the time, and for my part, more than one day at work left me wishing for a drink.) It quickly became the go-to place to wait for the bus at the end of the day. The whole Dublin stay wasn’t about eating and drinking though. 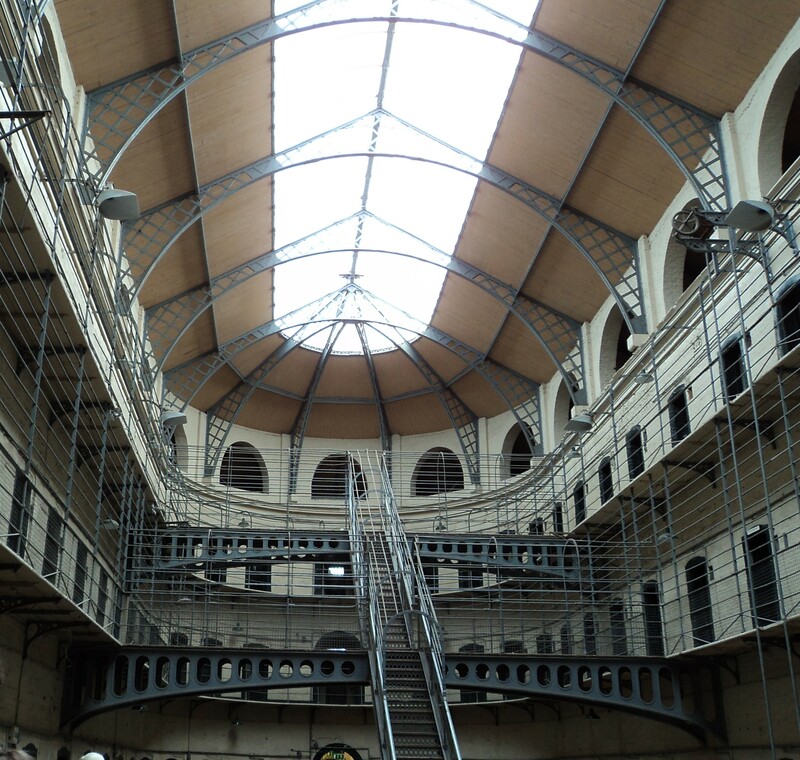 Kilmainham Gaol (which I recently caught a glimpse of in an episode of Ripper Street), The National Gallery of Ireland, Dublin Castle, St. Stephen’s Green, The National Museum, The National Library of Ireland (they have genealogy department, which is of absolutely no help when your family’s name is Carroll and no one remembers what part of Ireland they came from) Guinness Brewery at St. James Gate all had amazing stories to tell us. Prince Albert of Monaco happened to be visiting Trinity College when we were there (it took us a while to figure out what was happening with the crowds). 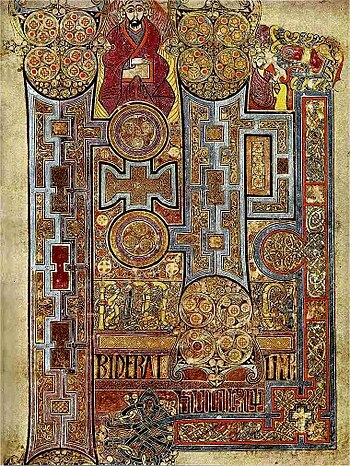 The Book of Kells just blew me away. They turn a page a day, and the illuminated pages are breathtaking. The the fine detail is exquisite. Sections of the Book of Kells were painted with a single marten hair. A single hair! 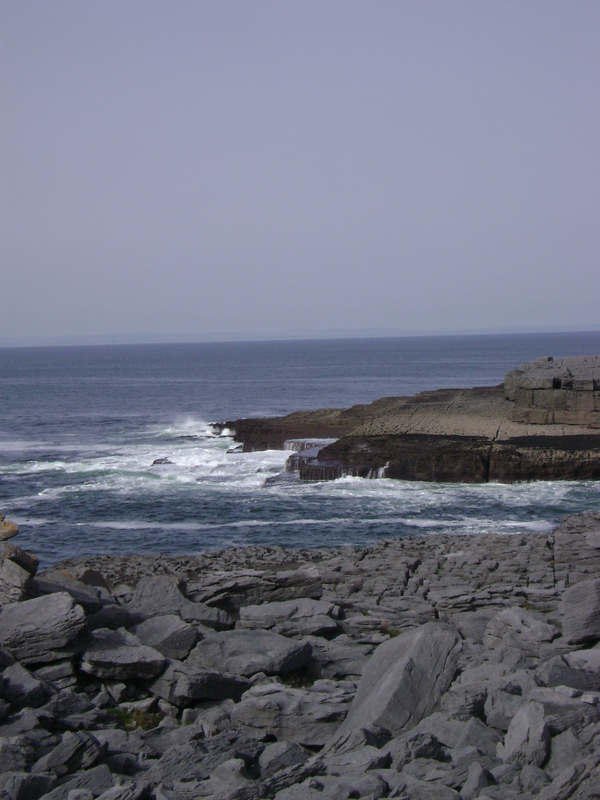 After a couple of days, we rented a car and drove to County Clare. Yes, I drove…on the other side of the road. No, it wasn’t really that hard, and I managed it with only an incident (or two) when I was gently asked by my dear friend if I knew I was in the wrong lane. Driving in the country was fun. Except for the narrow roads that ended in cliffs or walls or hedgerows…and tourist buses. I still curse the tourist buses. No shoulder, a cliff, a tourist bus and a Kia Sportage….I really wished for Mini more than once. However, we survived. I can’t say as much for the side mirror. A tragic casualty, but I hit it twice and only paid for a replacement once. BOGO?) With no real plan, other to arrive at Ballinsheen House before dark, we set off from Dublin. Me, I loved this part of the trip. No real hurry, no plans…no real idea of where we’re going. (That’s not true. We had a map and a GPS. Okay, we had a map. The GPS switched to Gaelic at some point and we couldn’t get it to give directions in English.) Cruising along the roads, we quickly figured out that brown signs usually indicated a tourist attraction. We stopped at Bunratty Castle for lunch and a walk through the folk park. The next day we explored. 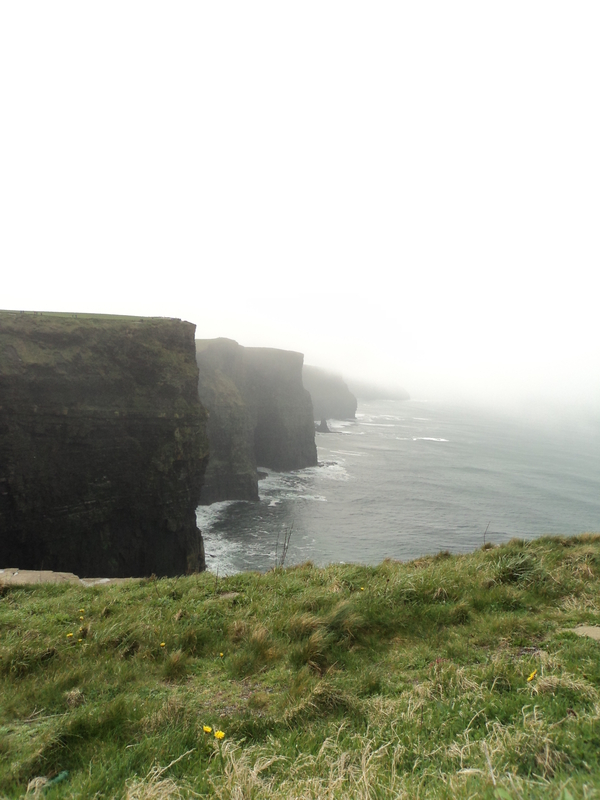 Our only certain plan was to go to the Cliffs of Moher and to stop in Doolin for drinks. 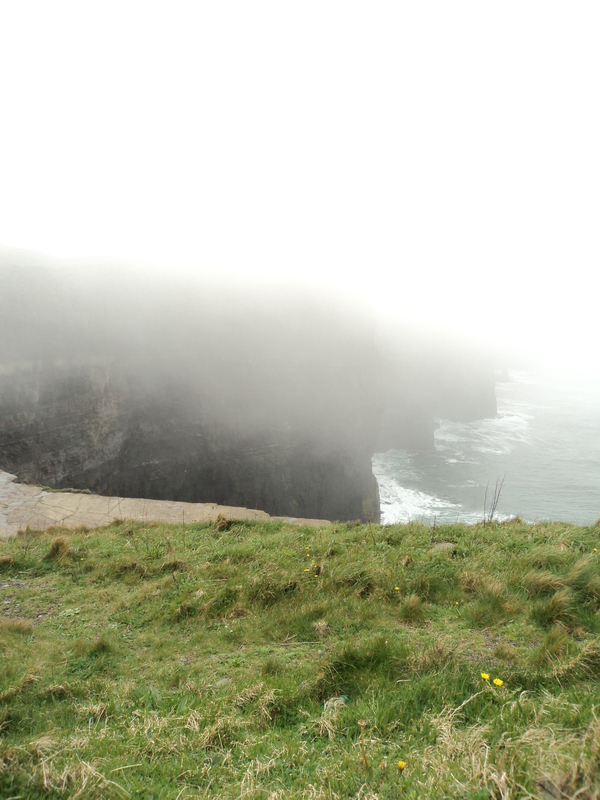 The Cliffs of Moher were shrouded in mist when we arrived. We could barely see our hands in front of our faces at first, and although we could hear the waves break against the rocks, we couldn’t even see the edge of the cliff much less the water below. Luckily, there are games on cell phones and (although this is the pot calling the kettle…) my dear bestie is stubborn and has much more patience than I do (sometimes). She’s also rather brilliant, so we took a break in the coffee shop and waited. The sun did come burn away the mist. 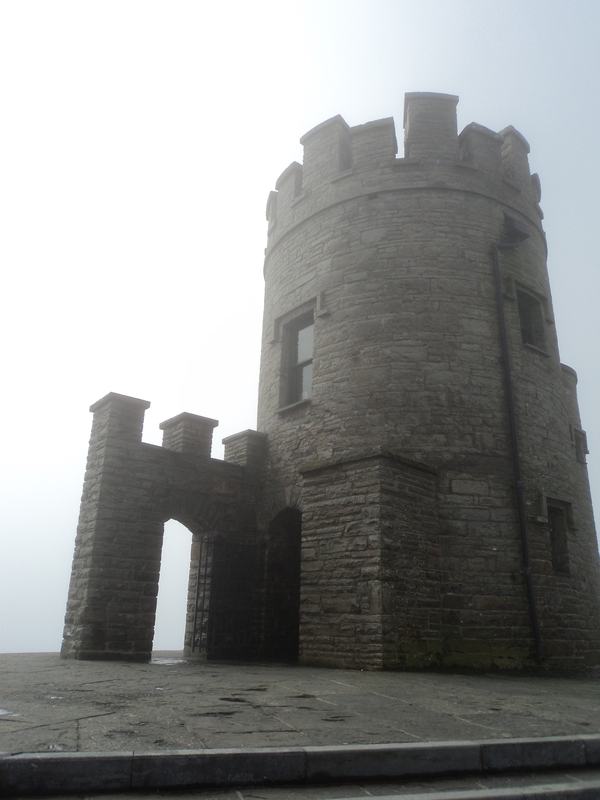 Once it had cleared enough to walk around a bit, we walked through O’Brien’s Tower. It looked like something out of a scary movie at first. Until you were right up on the tower, you could only make out a blur in the fog. I could begin to see why the Irish are such famed storytellers, there is plenty of source material in the shapes in the mist and the way it tosses sound around. My imagination was certainly working overtime that morning! Once the sky cleared, the view was absolutely breathtaking. When you live in a landlocked state, like Oklahoma, the ocean is endlessly fascinating, but when you also live someplace relatively flat and you throw truly amazing cliffs into the picture…I could have just watched the sun move across the water and the puffins chatter all day. My friend still shakes her head when I mention how many pictures I took on this trip. I just couldn’t resist! Gus O’Connor’s pub in Doolin was packed when we arrived, and although I’d really been looking forward to a pint of Harps…I drove…through the countryside….in the dark…with no streetlights, a winding narrow road and a speed limit that I found frankly ridiculous (and I have a lead food, believe me). While, I probably deserved the pint, I didn’t indulge, I wanted to a) not get lost b) not wreck the rental car or c) all of the above….I’m sure that didn’t need further explanation, but I couldn’t resist. There was so much history, and so much I’d never seen before. Every time I travel to Europe it is driven home how young America is in comparison. Stone walls that are 1,000 years old, neolithic burial sites…stairways still standing that Vikings tread upon. I didn’t get to see nearly as much as I would have liked. Then again, I think I could spend a decade exploring the country and still worry that I’d missed something amazing. P.S. The next trip is to Boston. Send us suggestions of cool places to visit, restaurants to try, whatever! This entry was posted on Monday, March 17th, 2014 at 3:02 pm	and posted in Uncategorized. You can follow any responses to this entry through the RSS 2.0 feed.